Already during the development process on the trip I started to deploy Mobispray in the evenings and nights and got many ideas about feature improvements which I then implemented the next day. 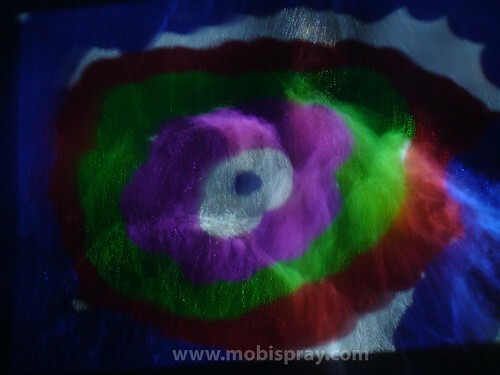 We experienced many fascinating MobiSprayingSessions and I call the collection of those ‘MobiSpray Summer 2008′. 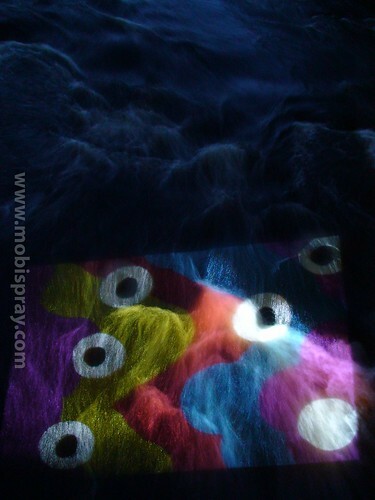 I hope you may find the photos and videos of our SprayingSessions inspiring and fun to watch! See an overview of all of the 16 mobispraying locations. Click on the marker to see images. 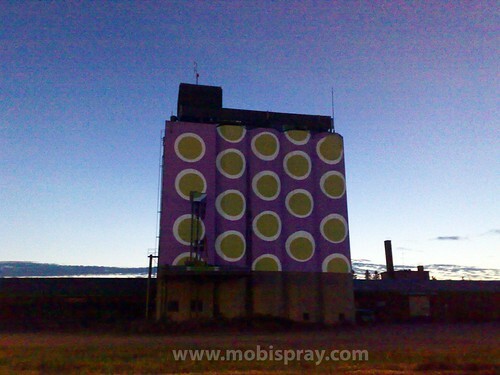 The last Spraying session during our MobiSpray Summer tour 2008 took place in Kuopio. 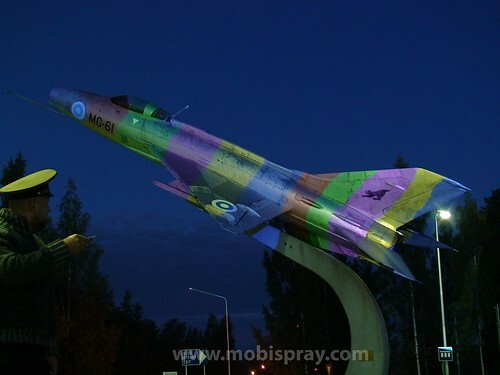 From a previous visit to Kuopio, I remembered seeing a MIG 19 on display close to the Rissilä airbase. This object should be the final highlight of having sprayed on over 15 objects during the previous few weeks. 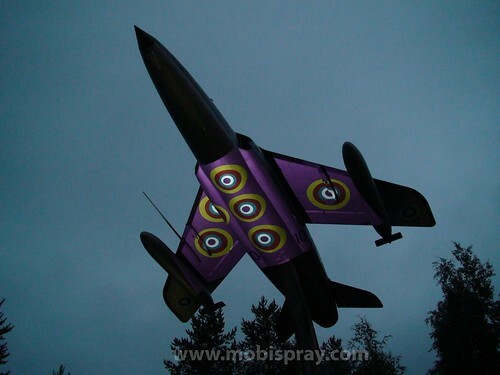 It has been a fantastic experience to develop, test and deploy Mobipsray during this MobiSpray summer 2008 tour. It gave me lots of insights what MobiSpray is about and what it can become. I would like to thank at this point the UBILife research project and especially Prof. Timo Ojala for his support. You can find all photos of the entire MobiSpray tour 2008 on Flickr here. 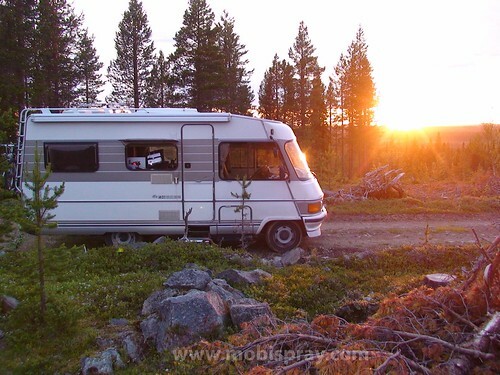 During our Mobispray summer tour 2008 we had the chance to get a true Lapland experience of fishing, picking cloud berries and going for a barbecue by boat when we got invited by Prof. Timo Ojala to a small village near Kemijärvi. 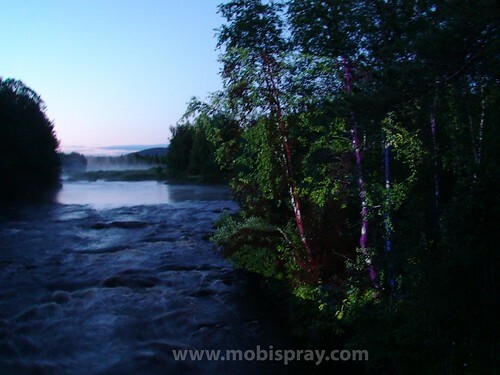 In the evening we decided that we want to mobispray on a rapid in a remote location that was about 1 hour away by rowing boat. We packed all MobiSpray gear inside the boat - including the power generator, the Lpatop, projector, wifi router, cables and my mobile phone - and then we listened to ducks, birds and the ‘entire quietness’ of Lapland while rowing towards the Rapid. At the location there was a suspension bridge over the Rapid, which allowed me to install the projector in such a way that its light went straight down into the moving water. I was exited to see how it looks to mobispray on water. Since it was a Rapid, many parts of the water were white, which revealed great textures. While the water was continuously moving the sprayed colour always remained on the same spot. It appeared on one hand like a film that plays, on the other hand it was also a static image. After a great barbecue prepared by Prof. Timo Ojala near the rapid, we rowed back and did some line fishing, unfortunately being unlucky of getting any fish. More photos at Flickr here. In Kajaani, north of Finland I spotted a huge grain storage building with a grey-brown surface. So far, I hadn’t spray-painted on huge buildings yet and this was a good opportunity to do it. I thought it is best to leave my video projector inside the car and when I had to park the car quite far from the building in order to cover the entire building surface with the projector light, I only then realized how big the building really is . 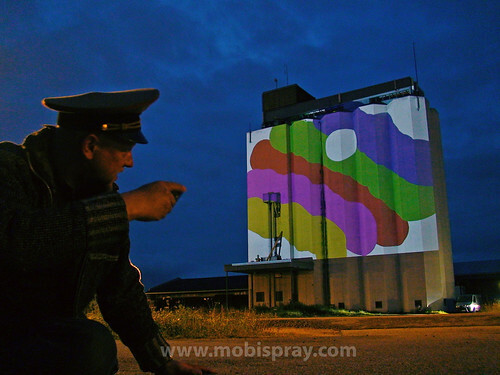 After I spray-painted the first few lines, I suddenly felt how powerful it is to spray on such a huge building with MobiSpray. 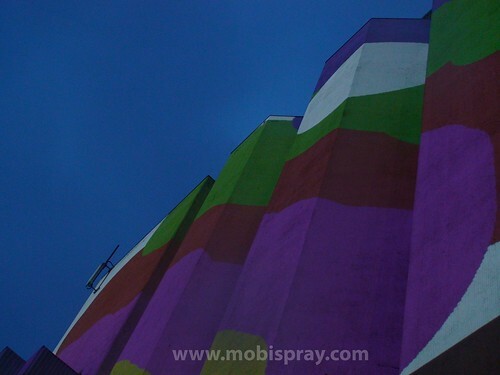 Just within minutes you can change the appearance of the entire building. This was an experience I never had before. It feels, one has the power over this building. Even if you don’t have keys for it, and are not the owner of the building, still one can decide how this whole thing should look like. 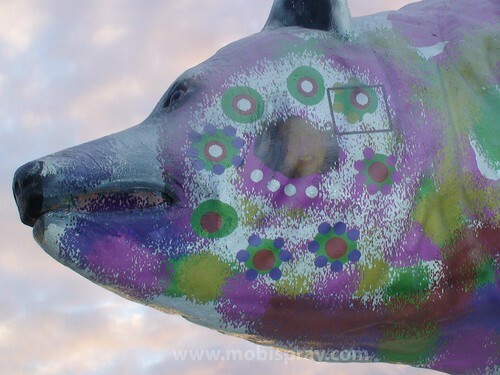 This means with Mobispray one can change one’s surroundings and turn them into something surprising, exiting and unexpected - at least temporarily. This triggered also the thought in my head, that with MobiSpray one can gain access to objects for turning them into something new. One can go beyond a fence or a closed yard, even overcoming height is not a problem, meaning you can enter with MobiSpray where you normally wouldn’t be able to enter at all. This made me think that wouldn’t it be interesting to mobispray on an entire neighborhood one day, and turn it into something completely new? On our way from Rovaniemi towards a city called Kajaani we accidentally saw a sign beside the road saying in finnish ‘aviation center’. 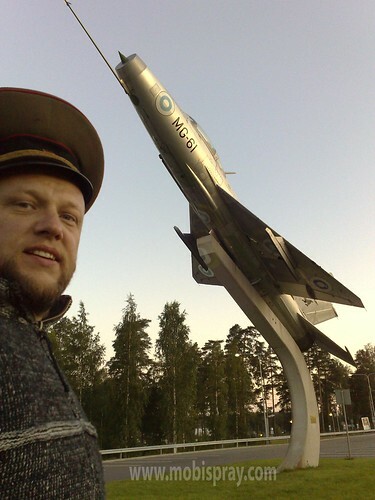 Well I never heard that Finland had an aviation center in the middle of nowhere, so I stopped and drove back and entered the side road leading to the finnish aviation center at Pudasjärvi. And then - I couldn’t trust my eyes - from far I saw a military aircraft on a huge stand on display - a Saab 35 Draken. What a surprise, finding another beloved object to mobispray on, just like that. After a short google search, I found out that we had arrived on a former airbase of the finnish airforce which was closed many years ago. No military buildings left, just a huge runway which is nowadays used by hobby pilots and glider sport people. 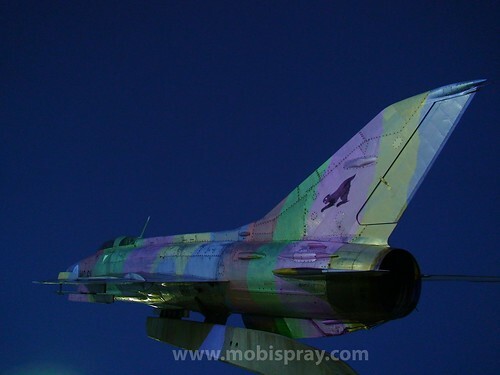 Ok, for the next few hours I could live out my passion - mobispraying on a fighter jet. 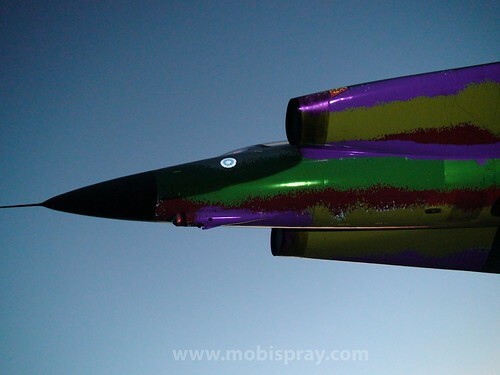 What really striked me was that I was able to spray on the entire plane surface underneath due to the orientation how the Saab 35 Draken was put on its stand. It was totally exiting to see the spraying results - the real plane looks as I want it to look and it is right in front of me. 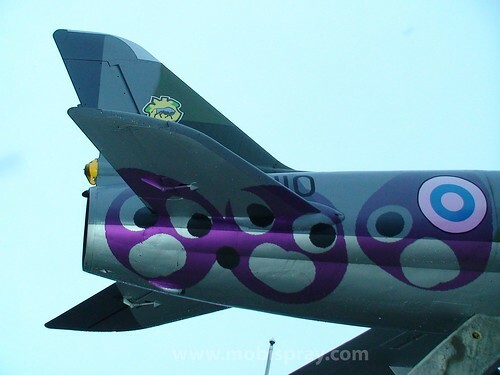 I remember, I was lying under the plane for at least half an hour inhaling this fantastic view, seeing the colours, the huge shape with its curves and forms. I have to say it was a strong aesthetic experience that really gave me an energy spark. Wow, that’s what Mobispray can do. Also, I felt, that somehow the plane belongs now to me. I believe that is the result of a highly cognitive experience that happened here. 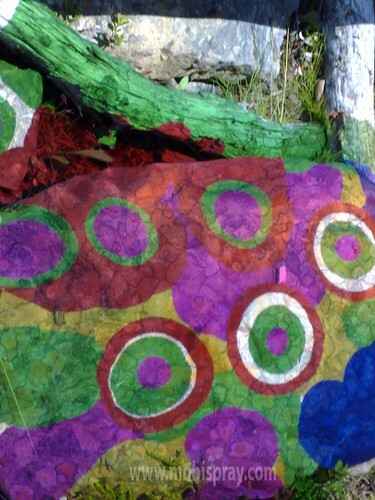 By adding my own creation onto the plane, the newly created whole has become part of my own, too. Well, I guess I will follow this thread later when I will report on the findings on design impacts and design aspects that come along with Mobispray as a tool. 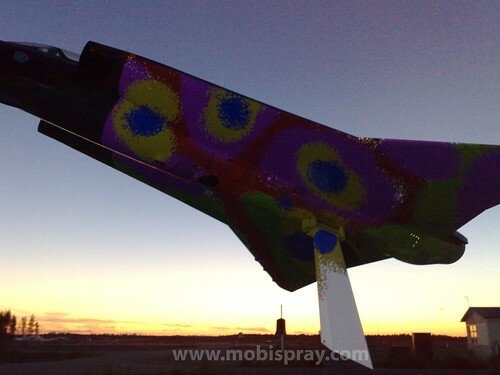 After having sprayed once on a military aircraft at the beginning of our MobiSpray summer 2008 tour, I was eager to do it again. Since Rovaniemi was on our route, I remembered once seeing an F-18 jet taking off at the Rovaniemi airport shortly after I had landed with a Finnair plane. I believed there must be an old fighter jet somewhere on display on the airbase area - as it is usually the case on finnish airbases. Shortly after we arrived at the mainstreet that leads to the Rovaniemi airbase, I spotted a Folland Gnat MK 1 plane, and luckily it was accessible since it is located on the area that is open to the public. Instantly I prepared my mobispraying gear and started happily spraying. BUT then - well not as to my surprise, really - the military police swiftly arrived and asked what I am doing here. Well I explained that I am a military jet fan and love to take photos of planes wherever I find them, and that I have brought my own special light equipment with me for shooting interesting photos - which is the case really, nothing more. They said this is perfectly fine and went away. I felt relieved and kept mobispraying until the daylight became too strong. 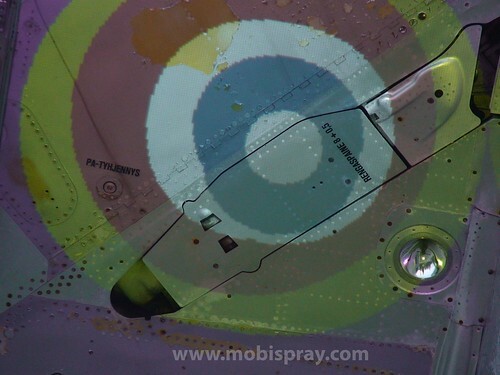 What is really interesting with MobiSpray, you can move directly under or beside your object that you spray on, so you get a real feel where you spray and you see with your own eyes how it appears. You really have the possibility to make an object look as you want it to be. MobiSpray gives a great degree of Freedom! 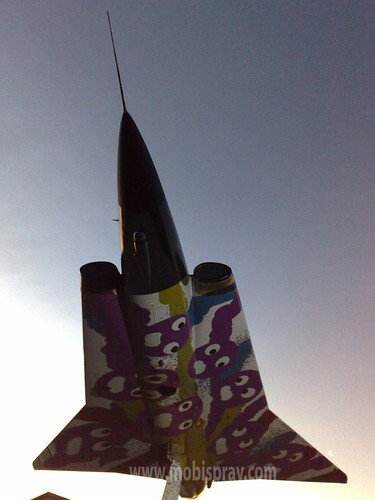 And I do really enjoy this freedom, making beloved real military jets my own - at least for a short while. 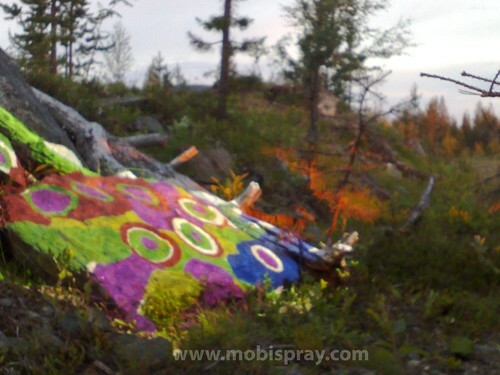 Still inspired by the Alta rock carvings I was driven to mobispray on a stone - and it should be deep in the woods of Lapland. After turning into a dirty road and driving for kilometers I found the ‘holy’ stone. Shortly after I had started spraying, I was already fascinated to experience how one can add something new to something existing and the outcome appears as something new, whole, unexpected beautiful and fitting into the nature, into the colorful tundra of Lapland. The emerging textures on the surface of the stone totally interesting, too. 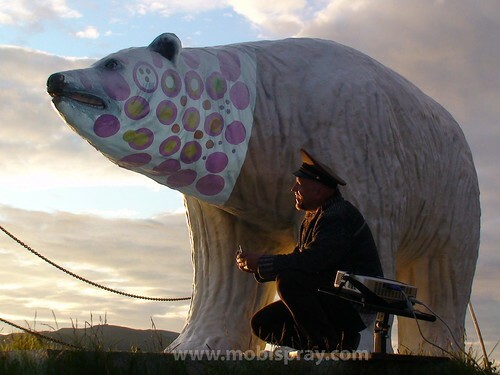 Our MobiSpray summer 2008 tour brought us to Hammerfest. When we arrived we had the midnight sun shining directly into our faces, just beside this huge polar bear, the landmark of Hammerfest. Surprisingly the bear had a white surface and it took only minutes if not seconds for me to set up my gear - and there I was - mobispraying on this huge creature. You are currently browsing the MobiSpray Summer 2008 site.